Every year I put together an Easter basket for my boy and it's something I thoroughly enjoy doing for him. Ever since I was a child, Easter has always been one of my favourite times of year and although I never received an Easter basket myself, my mam always made sure we had a chocolate egg and a surprise - one year, much to mine and my brothers delight, this was real live bunnies! I want my son to have the same fond memories of Easter and I love making the day as fun and as special as I possibly can for us all. This year I'm recycling a few items for my boys basket as he hasn't really looked at the Peter Rabbit books much, due to their Easter theme and he now has a fondness for Peter Rabbit (just like his mummy), so I thought it'd be nice to include these books again for him. Once again this basket was very cheap to put together. Jacek and I picked up the majority of the basket contents in Dealz and Aldi. I don't want Tyler Lee's Easter basket to be something to rival his Christmas Eve one, it's just simply a nice surprise for him to rifle through on Easter morning and I'd very much like to keep it that way. The Bunny of Bluebell Hill book. Little Lamb to the Rescue book. Peter Rabbit Easter Surprise book. A sweet little yellow bucket for our Easter egg hunt, we'll put his crayons in it after Easter. Natures Purest Pure Love Boy Bunny. Cadbury's Buttons Easter egg and packet of buttons. I decorated the basket (which is one I got in Penneys awhile back) with some blue and white polkadot ribbon, a little wooden rabbit decoration and some decorated eggs which I also got in Dealz, I'll be using these as part of our Easter egg hunt again. As you can see, we haven't gone overboard with the basket, it has a nice array of things in there and nothing expensive at all, the most I spent was €12 and I think that's perfectly acceptable, especially as people would be spending that much on a few Easter eggs anyway. 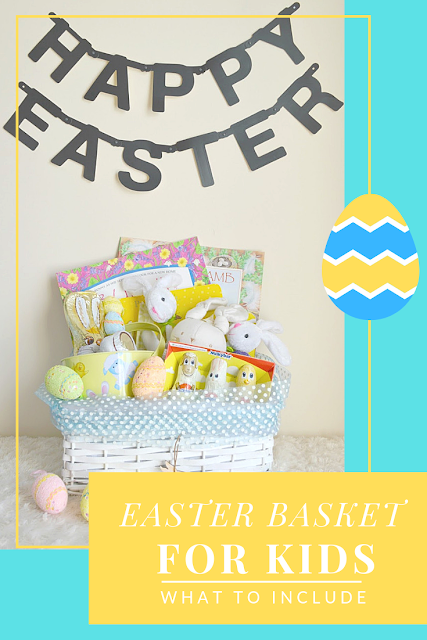 If you're looking for some more Easter basket inspiration you can see the baskets I've put together for Tyler Lee for the past two Easters here. That looks so pretty - and I love the easter banner too! I love how you put these easter baskets together, they always come out looking nice and have variety of items not just chocolates which is awesome. I've never done an Easter basket for my kids, but these look amazing! Aw I think it is wonderful that you have put together an Easter Egg basket and there is so much to choose from too! That does look fun and I like that it isn't too heavy on the chocolate (got to have some though). Gorgeous basket. I haven't put anything together. He's just getting his egg and 1 or 2 presents that he will look for in the garden.